Aug 25, 2015- The major four political parties—Nepali Congress (NC), CPN-UML, UCPN (Maoist) and Madhesi Janadhikar Forum-Loktantrik (MJF-L)—on Tuesday discussed the bloody incident of Kailali district. 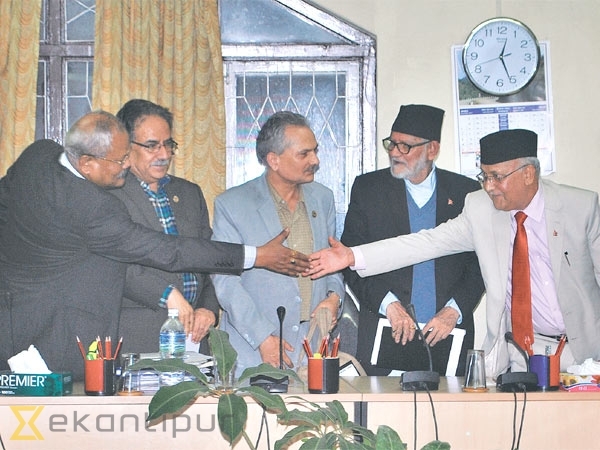 In the meeting convened at Prime Minister’s official residence in Baluwatar, the parties decided to direct the Home Ministry to take strong measure to maintain law and order situation in all the riot-hit districts across the country. The parties have also urged the Home Minister to remain alert and take steps to avert possible communal violence in Kailali and other parts of the country. The meeting also decided to intensify talks among the political groups to seek political solution to the crisis facing the country. The ruling Nepali Congress and CPN-UML have perceived the incident as a law and order problem while the UCPN (Maoist) and MJF-L have taken it as political problem.